Washington Nationals starting pitcher Max Scherzer throws during the ninth inning of a June 20 game against the Pittsburgh Pirates at Nationals Park in Washington. Last Saturday, Max Scherzer threw a no-hitter that was one regrettable pitch from being a perfect game. In the start before that, Scherzer racked up 16 strikeouts on his way to one of the best pitching performances of all time, and on Friday night, he was perfect through the sixth inning against the Phillies, striking out seven. Scherzer is far from the only pitcher demonstrating his dominance: Corey Kluber, reigning AL Cy Young winner, tossed an 18-strikeout game not long ago, and Michael Pineda struck out 16 recently as well. When you line all those performances up, it feels like the pinnacle of single-game pitching — Kerry Wood’s 20-strikeout game — is waiting to be surpassed. But even in this era of strikeouts, the record is probably as safe as ever. In 1998, a young Wood threw a complete-game shutout in which he walked no one and struck out 20.1 Wood’s game earned the highest-ever Game Score, a metric that measures the extent to which a pitcher controls the game. Combining both the positive (strikeouts, run prevention) and negative (walks, hits) aspects of a hurler’s performance, Game Score is an overall number that measures a pitcher’s mastery. Wood’s historic start earned him a 105. There have only ever been 12 games in which a pitcher met or broke 100 in nine or fewer innings. When Wood pitched his famous game, batters struck out in 16.9 percent of their plate appearances. This season, that number is up to 20.1 percent (although down slightly from 20.4 percent last year). To put it another way, the league average for starting pitcher strikeouts per nine today would have been the 21st best mark among qualified starting pitchers in 2005. Offense has suffered accordingly, with runs per game falling by about 10 percent since 2005. Yet the trend isn’t so much toward starts with huge strikeout tallies, but rather away from low-strikeout outings. This graph shows the share of games in which a starting pitcher racked up each number of strikeouts. Between 2011 and 2015, there were 9.3 percentage points fewer games where the starter got four or fewer strikeouts compared to 2005-2010. There has also been some increase in top-quality games: For example, games with 11 or more Ks now constitute 2 percent of all starters’ outings, up from 1.2 percent in 2005-2010. However, the most extreme strikeout games have not increased nearly as much as the rising strikeout trend would suggest: We aren’t seeing many more games with 16 or more strikeouts,2 and overall Game Scores have barely budged, moving from 49 to 51 in the past 10 years. That means Wood’s record is still nearly untouchable. Yes, Scherzer’s 16-strikeout start earned a 100 Game Score, putting him in rarefied company. And yes, Kluber’s 18-K start lasted only eight innings, denying him his small chance of matching or beating Wood. But it’s relievers, not starters, who are tallying most of the increase in strikeouts these days. Not only are relievers throwing harder than ever, and to greater effect, but they are also being used more and more. Strikeouts per nine rose by 1.26 between 2005 and 2015, but starters were responsible for less than half of that swell, going from 4.09 to 4.7 strikeouts per start. The problem is that it often takes a lot of pitches to get a strikeout. On average, in 2014, strikeouts required 4.5 pitches per plate appearance while outs on balls put in play took only 3 pitches. Every strikeout a pitcher gets drives them closer to their pitch-count limit even as it increases their Game Score. Any pitcher working on a record-challenging game must therefore contend with his manager, whose goal is to preserve the pitcher’s arm for another day. Kluber’s potentially historic performance was disrupted by just such reasoning, and it prevented him from getting a chance, however small, to break Kerry Wood’s record. The recent drop in pitch counts is also partly attributable to sabermetric research. With the revelation that pitchers gradually decline every time they go through the order, there has been a shift toward pulling starters before their performance begins to tumble. Starting pitcher performance falls even when they have been cruising through the lineup, mowing down hitters. In potentially record-breaking games, a manager must often choose between a starter whose expected performance is league average (or worse) in their third time through the order versus a fresh reliever whose strikeout potential exceeds even the best starter. It’s no surprise that most managers opt to lock down the win. 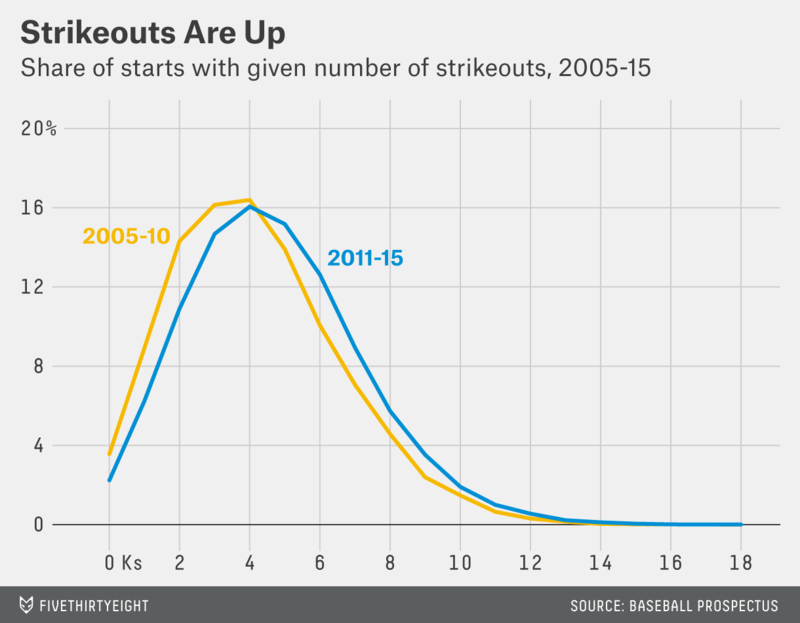 Major League Baseball has traded raw strikeout potential for endurance. The question now isn’t whether a pitcher can dominate the opposing lineup, it’s for how long. CLARIFICATION (June 28, 11 p.m.): This article has been revised to make clear that the period between 2011 and 2015 had fewer 115-pitch outings than the period between 2005 and 2010. Thanks to Dan Turkenkopf and Rob McQuown for help with data and in calculating Game Scores. Roger Clemens and Randy Johnson are the only other pitchers to have ever struck out 20 batters in a start. These outings went from 0.02 percent of all games to 0.023 percent of all games. Ever fearful of injury, teams may have imposed these limits in hopes of protecting their starters’ arms (albeit to little net effect). These outings were down another 12.5 percent in 2014 compared to the overall 2011-2014 rate.